Home Tags Posts tagged with "Greenpoint"
Krolewskie Jadło, in Greenpoint, is easy to find. 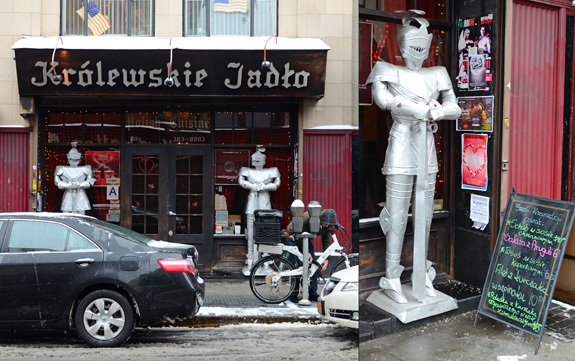 Not just thanks to its proximity to the subway, but because the owners chose to get all medieval — the restaurant name means royal food in Polish — and install two imposing armored knights in front of the doors. 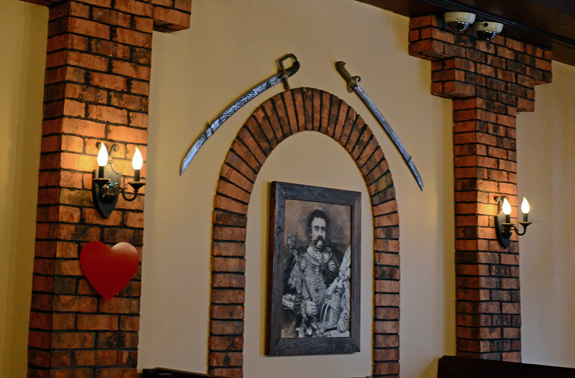 Inside, the decor is equally cheesy, with portraits of kings, a profusion of swords and wall chandeliers that make the cardboard Valentine’s Day hearts and the surveillance cameras slightly out of place. 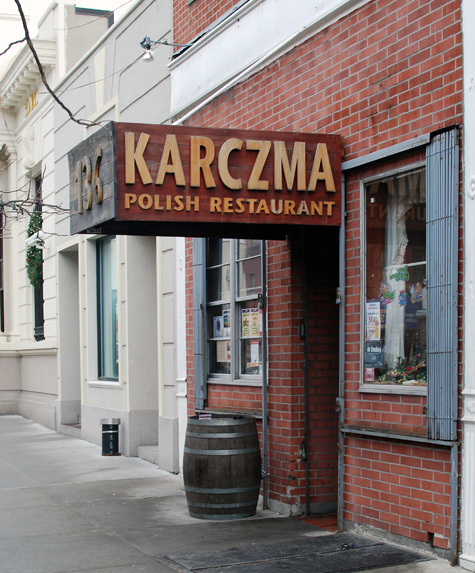 The extensive menu covers most if not all of Polish cuisine. 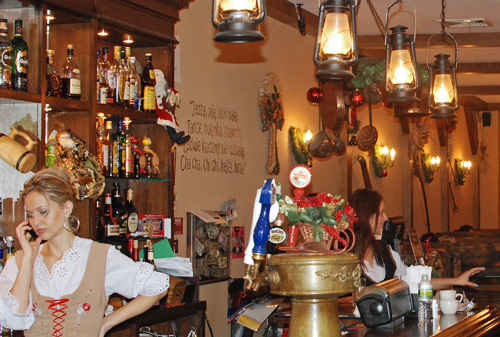 You can choose from no less than 4 kinds of borscht and 5 different pierogies, of course there’s stuffed cabbage and hunter’s stew, and the koryto platter combines all the sausages and grilled meats you can dream of. But what really drew my attention was the large selection of game dishes. Wild boar, pheasant, venison! If it wasn’t for the decor and the low prices, you could almost imagine you’re looking at Daniel Boulud’s game dinner menu. 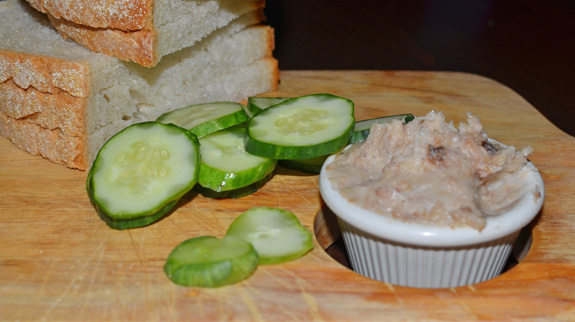 The meal started with the bread plate accompanied by some slices of cucumber that none of us really cared for, and a ramekin of good, rich, lard spread. The rest of the dishes came in seemingly random order with a complete lack of timing and disregard for available table space. 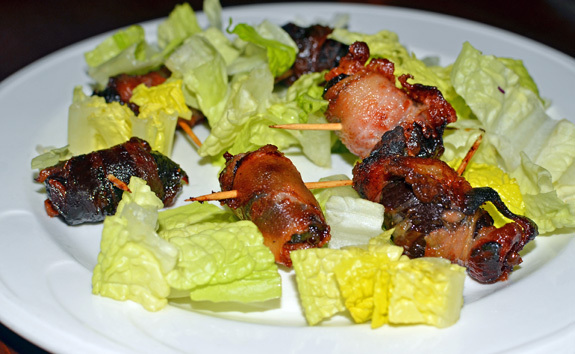 The prunes wrapped in bacon were pleasant, but this has to be the simplest dish ever served in a restaurant. I don’t think we touched the salad, which seemed to suffer from some kind of chromatic disorder — I was always told that salad was green, not yellow. 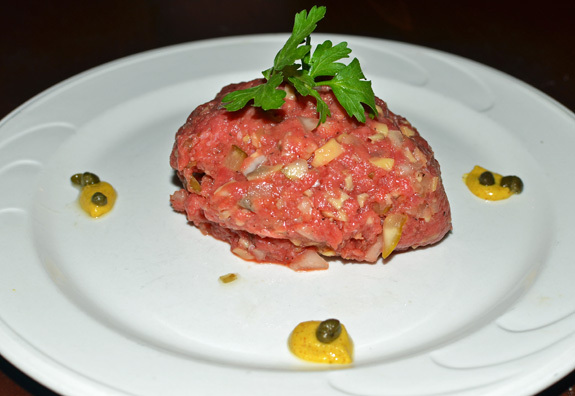 The beef tartar arrived already mixed — I prefer combining the ingredients myself. It tasted a bit too vinegary (something that typically happens when you don’t drain the pickles enough before mixing them), and the ingredients were a bit too coarsely chopped. 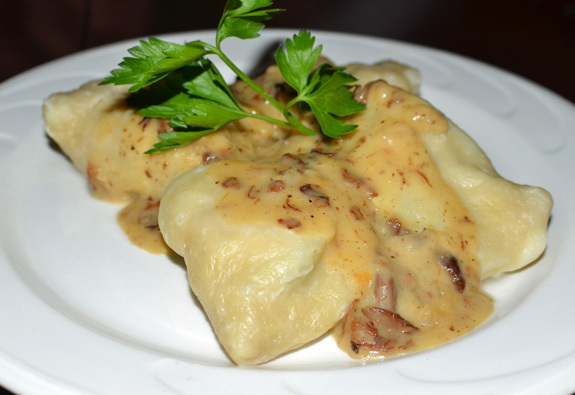 The chef’s pierogies with chanterelle sauce were large, enjoyable dumplings filled with goat cheese and spinach, and covered with a sauce that really did taste like chanterelles. The “little bags full of pheasant” in blackcurrant sauce were an original idea. The filling of ground pheasant and minced vegetables could have used more salt, but the result was nice. 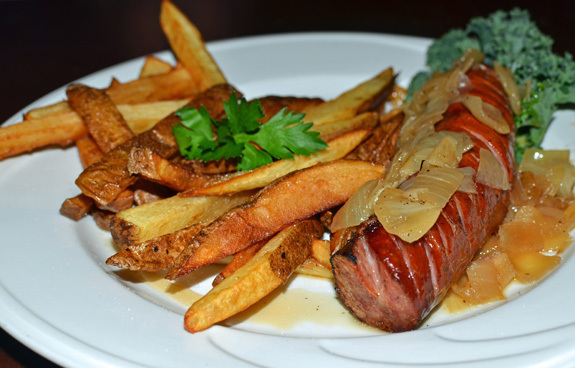 No surprise with the grilled kielbasa: the sausage, topped with sautéed onions, was good, smoky and juicy. Too bad the fries were just OK. 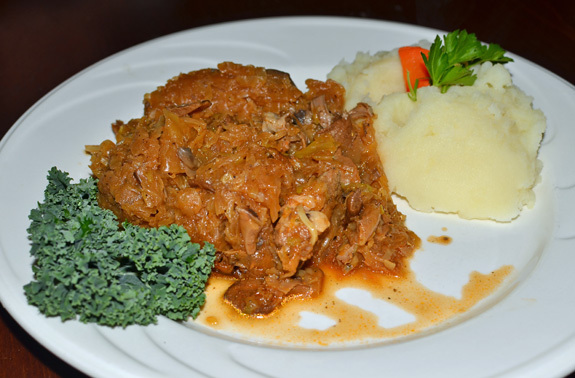 The hunter’s stew (bigos in Polish) consisted of very tender pork meat with sauerkraut. I’m not even going to start my customary bitching about the plating and the straight-to-garbage garnishes; the picture speaks for itself. 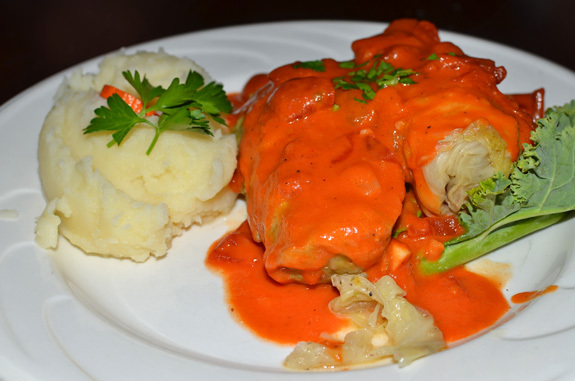 The gołąbki, cabbage rolls stuffed with rice and meat and cooked tomato sauce, were slightly bland and needed more salt. This dish often tends to be left cooking for much too long, which explains why the flavors end up being so indistinguishable, and the cabbage leaves so pale. 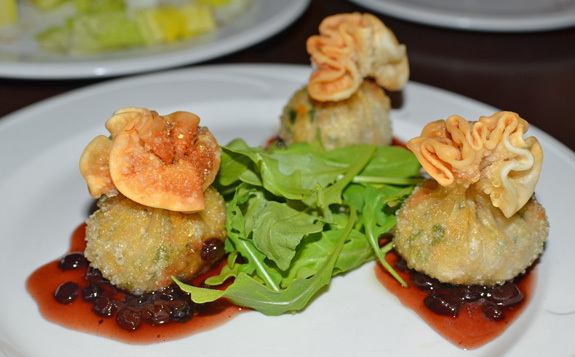 The venison walnut meatballs were nice, but the combination of the nuts and excessive cooking made them rather dry. The sauce of black trumpets with truffle oil had a very pleasant taste. The garden dumplings, rather doughy and boring, came in a totally disproportionate amount and there wasn’t enough sauce to coat them with. The stuffed wild boar suffered from some of the same faults. 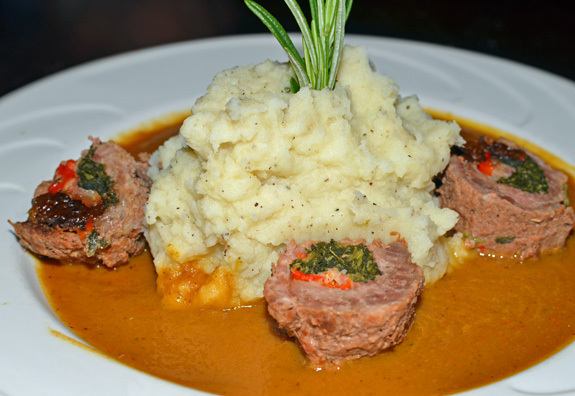 The kind of roulade stuffed with spinach and red pepper was way too dry, so much so that the cognac sauce hardly helped. 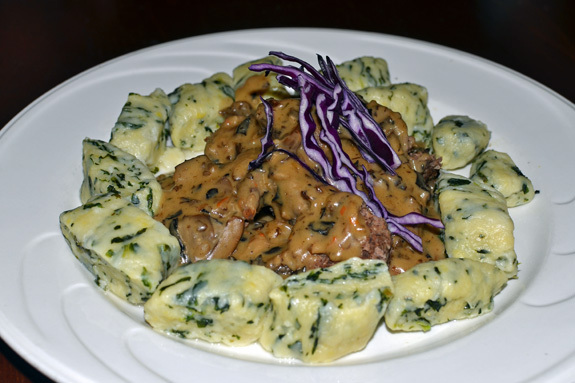 The horseradish potato purée, a massive mound with a rosemary bush dominating the center of the plate, could have fed, though not really satisfied, a small family. 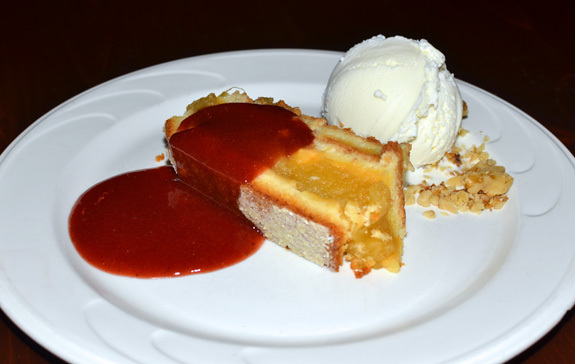 If you have room for dessert, you can order sweet pierogies and pancakes, or a few more “conventional” desserts. 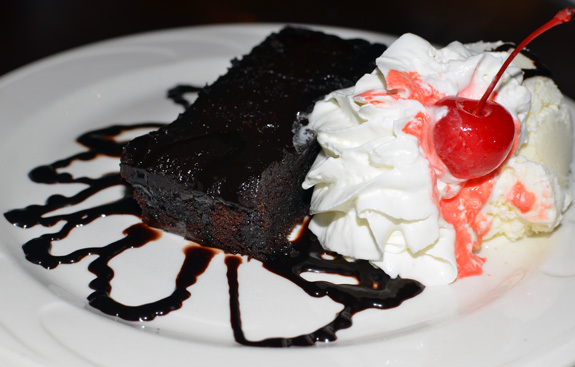 The warm chocolate cake had little going for itself. The chocolate was of poor quality, and so was the ice cream, which hardly had any flavor. The whole suggested heavy use of cheap store-bought products (whipped cream and maraschino cherry anybody?) and minimal labor. On the other hand, we had to try the homemade apple pie. I wouldn’t really call it a pie, as it was more like a cake. Save for the American habit of systematically pairing apple with excessive amounts of cinnamon, it provided a pleasing end to the meal. The strawberry sauce was equally good. Krolewskie Jadło clearly put some thought and effort into creating its menu, and it’s too bad the execution doesn’t keep up. I would greatly prefer half the quantity of food if the quality was twice as high — I don’t go to restaurants with the intent to fill my fridge with leftovers! It also seems to me that by reducing the number of dishes offered, the kitchen wouldn’t need to cook many of the dishes so much in advance that they end up overcooked, bland or dry.